Peter Martin: What if the rest of Australia copied Queensland? What if the rest of Australia copied Queensland? I referred to this graph on ABC 891 Adelaide today. 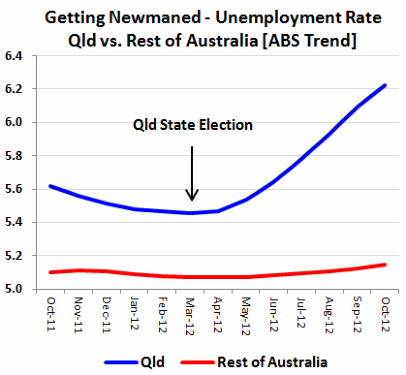 "Reading Queensland Treasurer Tim Nicholls’ attempts to explain away the latest unemployment figures, showing Queensland pulling up the rate for the country as a whole, the question that springs immediately to mind is: Why bother? Wouldn’t he be better off with some Thatcherite “No pain, no gain” rhetoric, promising that the cuts his government has implemented will yield payoffs for all Queenslanders in the long run. Other things being equal, sacking 14 000 people in a state with 2 million or so employed workers will raise the unemployment rate by around 0.7 per cent, which is exactly what has happened. Of course, as Nicholls points out, other things aren’t all equal. The mining boom has slowed a bit and commodity prices have come down from their recent peaks. But that only points out the dubious timing of these massive cuts. Under boom conditions, public sector workers would have more easily found new jobs. Nicholls can, perhaps, take comfort that ‘second-round’ effects have yet to show up in the statistics. The nurses, social workers and firefighters his government has sacked have less money to spend on goods and services of all kinds. The tens of thousands who were threatened with the sack but ultimately spared would also be looking harder at discretionary spending. The effects of this may show up in retail employment over the course of 2013. Bushfires. Good money after bad?